Chocolate and bananas. One of the most perfect flavour combinations ever don't you think? 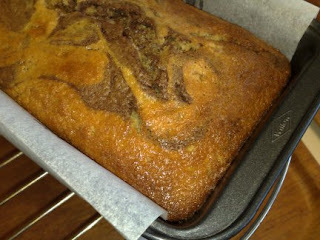 This week Ashlee from A Year in the Kitchen chose Dorie's Black and White Banana Loaf. The only change I made was to leave out the rum and use maple syrup instead (which probably added a little too much sweetness). I also found it was cooked a lot earlier than the recipe said - 70 minutes instead of 90. Wow. Seriously. This cake is moist and packed with flavour. 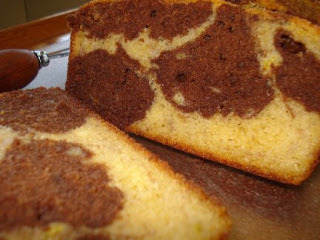 The banana and chocolate are complemented by a hum of lemon and nutmeg in the background. Perfect to enjoy with a cup of tea (which is exactly what i'm doing as I type!) I can see this becoming a regular. Next week: Blueberry Sour Cream Icecream. The bowl from our icecream maker is in the freezer and ready to go!